This is the first book I have read by David Baldacci, but it will not be my last! The Innocent (Will Robie #1) is a novel/book I could not put down. I finished it very quickly. I listened to the Audible Edition. The story of an American who kills baddies around the world, that’s Will Robie’s job, and he’s the best. It also is the story of an assassination that he is assigned that doesn’t feel right and he couldn’t do. It is also the story of the daughter of the woman he was to have assassinated, Julie Getty. And all the families and soldiers’ stories from a squadron from the first Gulf War. This story is so intricate, fully developed and amazing. It is a must read. There are several wonderful reviews online. Except this time, he’s being sent after a different type of target–a woman, an American, a mother. At the crucial moment, Robie refuses to fire. It doesn’t smell right. Someone finishes the job with a long-range sniper shot, and it looks like they’ll finish Robie as well if he doesn’t run. Having established himself as the premiere writer of “conspiracy in high places” thrillers in 1996 with his first novel, Absolute Power, which was made into a hit movie starring Clint Eastwood, David Baldacci has now written over 20 novels and remains the master of that subgenre. In The Innocent, the author remains at the top of his game. More in both reviews. Don’t miss this book. It is a must read. I am so glad that I finally got around to reading this wonderfully woven story! I will be reading much more by David Baldacci! Freedom™ and Freedom™ – I have read both the audiobook and what they are calling the hardcover book* of Book 2 or the 2nd book in the Daemon books. Freedom(TM) was amazing, and the culmination of the Daemon story. It was the story of how the people on the Darknet made use of the Daemon technologies to do good, to create cooperative sustainable societies on the ashes of the failed societies before it, and what that meant to, and could mean to, the masses of the world. I will leave it there. This is a must read book after Daemon. Don’t give up after Daemon because it left you hanging, or because Daemon was a slow starter. There is a reason they broke the two books out like they did. This one moves much faster than Daemon did right from the start and never lets up. Graphic violence is still quite in evidence in this book as it was in Daemon, but from a different angle, so be prepared for that. As background: Daemon and Freedom(TM) were originally self published as a single book and it did very well among those in the geek community due to it’s awesome technology and understanding of the online virtual worlds, but when the books were commercially published, the book was broken into two books. It has worked out well enough. The second book really does just continue where the first book left off. The entire story is amazing. Such great imagination based on tech that has been discussed in research papers and what can be done with it all that amazing tech (some good/some bad), but some of which has not seen light of day even if it’s technically possible. Some is possible but still theoretical. Daniel Suarez has taken it to the next level technically, politically and societally. Darkness Rises, Book 4 is about Etienne, one of the brothers and sister and the lady he falls in love with. Krysta and her brother have been working together (Krysta luring and killing vamps) and her brother watching her back, but a another vampire, but not a vampire at the same time, saves her life and even appears to be stalking her. Oh, and the private soldiers are back trying to snag Immortal Guardians! And Etienne is almost caught while trying to save Krysta. They are all in danger! Didn’t Seth and David take care of all this before? Is there something else going on? Is there a traitor in the ranks? So much in this book, so many twists and even some things left for the next book it seems. I love every book of the Immortal Guardian Series. This one is no different in that regard. But, it is wonderful to find all new angles coming up for each book, and even glimmers of future books as well — maybe the last of the Lisette and Zack maybe? Also, so far Kristen Potter has again done a wonderful job on narrating this book published by Tantor media. I did get it from Audible though. BTW: I really like the image for the book better than the audio version. Wish they had used the same one for both. The ebooks I got from both Kindle ebooks and B&N Nook ebooks over time. Can’t wait for the other’s stories! I have read most of Dianne Duvall’s Immortal Guardian books here at goodreads.com in the fantasy, romance, paranormal fiction. Will also have to check out other books that Kirsten Potter has narrated because she has done a great job on the Immortal Guardian Series books. Hopefully she will continue to do them Dianne Duvall and Kirsten Potter do very well together. I have read the first 4 books in ebook and audiobook versions. Well worth reading for anyone that enjoys paranormal romantic fantasy. James Cambias (also as James L. Cambias) is an American science fiction and fantasy writer and tabletop game designer, whose stories have been nominated for the Nebula Award and the James Tiptree, Jr. Award. Cambias was a nominee for the John W. Campbell Award for Best New Writer in 2001. Born and raised in New Orleans, Louisiana, he received a degree in the History, Philosophy, and Social Studies of Science and Medicine from the University of Chicago. He currently lives in Western Massachusetts with his wife and two children. His early writing focused on role-playing games, particularly adventures and support material for Space 1889. His first role playing book was published by Iron Crown Enterprises in 1994, and he has written or contributed to books for Last Unicorn Games, Hero Games, and Steve Jackson Games, including Star Trek: The Next Generation Role-playing Game, GURPS Mars, Star Hero, and GURPS Space. He is one of the founders of Zygote Games, and the co-designer of the gameBone Wars: The Game of Ruthless Paleontology, based on the Bone Wars of the late 19th century. His first professionally published fiction appeared in 2000. His work as been published in The Magazine of Fantasy and Science Fiction, The Journal of Pulse-Pounding Narratives, Crossroads: Tales of the Southern Literary Fantastic, All-Star Zeppelin Adventure Stories, Hellboy: Odder Jobs, and several Year’s Best anthologies. He is the author of the 2014 novel A Darkling Sea about the encounter between humans and two species of sentient extraterrestrials. When it comes to stories about contact between alien races, you have Star Trek‘s Prime Directive of non-interference on one hand, and willingness of the Culture of Iain M. Banks to apply a little force to help a civilization on the road to what it considers the right path. 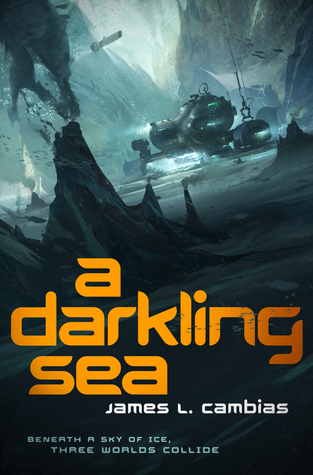 Somewhere in between lies the dilemma facing the three species colliding in James L. Cambias’s A Darkling Sea. While most life on Earth is powered by chemical energy captured from solar radiation, deep in our seas there are entire ecologies powered by volcanism – specifically the hot water issuing from hydrothermal vents. Hot mineral-rich water supports a food chain based on chemosynthetic bacteria and archaea; it extends upwards in complexity through giant tube worms, clams, limpets and shrimp. These animals live miles further down than sunlight ever reaches, in an extreme of pressure and frigid temperatures that would kill any surface life in short order. In recent years planetary astronomers have come to believe that beneath the icy surfaces of some of our gas-giant moons there are dark oceans of liquid water. Tidal forces acting on the moons power volcanism; Europa, in particular (the smallest of the four “Galilean” moons of Jupiter) is suspected of having its own hydrothermal vents. Exobiologists think it is relatively likely that life has evolved around them. James Cambias’s A Darkling Sea (Tor) transplants the Europa scenario to Iluvatar, a moon in a solar system roughly half way between future Earth and the homeworld of aliens called the Sholen who are attempting to limit human interstellar expansion. A peace treaty with the Sholen constrains human scientists living in a seafloor habitat beneath the ice. They chafe to make contact with the intelligent arthropods at the top of Iluvatar’s foor chain, but are forbidden from contaminating their culture. Thanks ESR! Always love to be directed to a new author, particularly a good SF/Fantasy writer, and a good book by that author. Pines (Wayward Pines Series (Book #1) by Blake Crouch – Brilliance Audio – got it from Audible – click on the image to go to the goodreads page for this audiobook. WhisperSync is available for the book. I gave Pines a 5/5 Stars (technically a 4.5/5 Stars but they don’t have 1/2 points at Audible and goodreads). I purchased it because it really sounded interesting on the Audible Daily Deals. This was a book that was so captivating right from the start, but I had no idea where it was going for a long time! The book sucked me in, the narrator sucked me in, and I wanted to find out what the heck was going on! This book was way too interesting and puzzling to put down. When I finally got to the point where things were coming together, and we as the reader finally find out what is going on … things just fell into place like tumblers. The narration by Paul Michael Garcia was fantastic. Anyone who enjoys a good suspense, mystery, thriller, science fiction, fantasy story would likely enjoy the book. I know I did. I just finished this today and I had to write about it today! Enjoy!